It almost seems like a lifetime ago since the first episode in The Walking Dead: Season One hit every device on the market. Clementine was but a mere child back then, hiding in her treehouse during the walker outbreak. It was from there where she first crossed paths with Lee, her adopted father figure who would go on to provide the necessary support, guidance and mentorship for her survival. So much has happened since that fateful day. The gap between then and now is heavily burdened with so many dire moments of loss, grief and difficult decisions. The dead have drastically and unforgivingly reshaped the world, along with those alive who continue to struggle within it. In The Walking Dead: The Final Season Episode 1 – Done Running, our young protagonist is at the tail end of her adolescence. Robbed of her own childhood, Clementine must be the one to rise up as both parent and mentor. An unfortunate role to helm, to say the least, but now she is far more experienced than the history professor turned convict who guided her in the first place. AJ, the young boy whom Clementine plays the maternal guardian to, is around six years old at this point. A cautious kid full of fire in his belly and known to be a killer shot with a pistol. It is AJ’s sense of mentality of the world around him that plays centre stage here. A boy, completely oblivious to the order of civilisation that was set in stone before his time. Clementine does her best to teach AJ the laws that separate humans from animals. However, the uneven weight that lies on the other side of the fulcrum sees the boy struggle to get to grips with the leisure of manners and mercy. He is still a child after all, and there are moments where he sets aside his own inhibitions from being as such. It’s here where the direction of the tale takes an interesting route. After an explosive, pre-credit introduction, Clementine and AJ take refuge in an old boarding school run by a gang of kids. The group, who live by their own set rules to maintain a stronghold of the area, have a The Lost Boys riff to them that is compiled from both Steven Spielberg’s Peter Pan spin-off Hook and the 1980s vampire flick. However, unlike the lost children in Hook, most of the kids here are aware of the necessities of self-discipline. The group itself is lead by Marlon, an older teenager who questions his own leadership and clearly takes hairstyle tips from a postpubescent Kiefer Sutherland. The first episode is fairly light on overall action and upsets. Not to say that there aren’t any, there’s just more emphasis on character building and future possibilities for Clementine and her newfound friends. While tensions do rise at several points, it was the quieter, more intimate moments that I appreciated the most. Moments that I found more believable than anything that the TV show has ever fed to me over its eight series run. The portrayal of the young characters flourishing with their own creative skills abided well with me. Watching them keep the torches of their talents lit goes to show how some qualities in life don’t die out quite as easily. It’s within these small indirect details to imply that there’s more to survival than just staying alive. Of course, you still have the predictable hoop-jump through sections of scavenging and zombie bashing that’s sewn so deeply within the franchise. These situations act more of an introduction to a slightly new gameplay system that has been put in place. This addition of freeform character movement and camera control flirts with the idea of a Resident Evil 4-style gameplay mechanic. It’s not nearly as tight or responsive as you would find in the Capcom classic, but there are some tense moments towards the end of the chapter that utilise the feature well enough for it to work. Other than that, the gameplay is still riddled with QTEs aplenty, but that extra elbow room when employing the new gameplay system does widen out the interactivity more than usual. What has evolved is the game’s visuals. While The Walking Dead: A New Frontier started to beef up the aesthetics to draw you further into its comic book world, The Walking Dead: The Final Season has brought with it even finer linework with a gorgeous yet moody colour palette. Even the introduction sequence has a high-budget TV series-style to it. The animation can still be quite stuttery though, and despite TellTale’s excellent use of cinematic camera angles, characters can still come across a bit doll-like at times. The game also looks much sharper when playing docked to the TV. However, the softer edges and slight blurs in Handheld Mode are a small price to pay if you want to soak up the experience like you would a book. The focus on a younger, much more adaptable generation of survivor seems a fitting plot to kick off The Walking Dead: The Final Season. 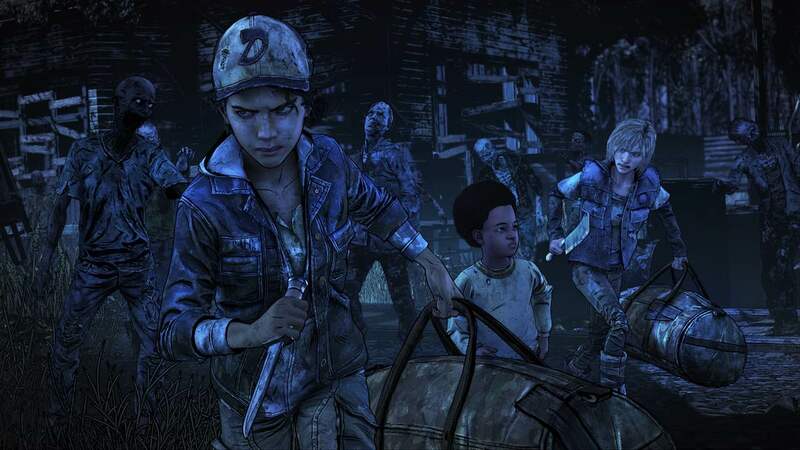 With AJ learning the ropes of how to adapt with his peers and Clementine’s life experiences set up to be put to the test, it looks to be a promising farewell for the popular corner of the franchise. We know by now from previous games that despite the choices you make, the plot generally steers towards the same direction. However, the implementation of small blurbs for each character based on your decisions is a nice spin to the stats as the credits roll. It’s the little touches such as these that make a story like this one engrossing. It is also this kind of interaction with the cast that makes the harsh conclusions that the series is known for all the more poignant.